Londo, have thought of you all week. Looked bad when it hit land. Glad to hear you were able to work from home and all is ok now. Thanks Molly, now we have to pray for those who will be affected by swollen rivers shortly. They have already closed the Brazos river turnaround on 59, it's already under water and will get worse over the weekend. Areas of Richmond and Rosharin will be affected by Brazos flood waters. I think Wharton will have flooding issues with the Colorado river as well. GAINESVILLE TEXAS (CBSDFW.COM) – Creeks, lakes and rivers overflowing their banks isn’t just a problem in the counties in and around Dallas and Fort Worth. The Red River at the Oklahoma-Texas line has risen so high that officials may have to shut down the Interstate-35 corridor. The river has risen even more since this image was captured. 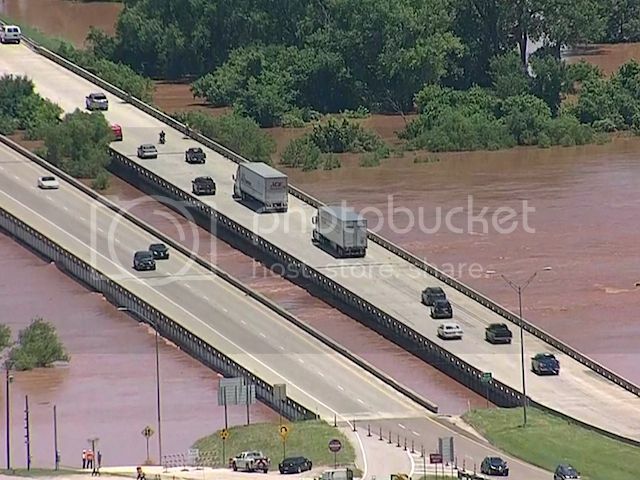 No-one is quite sure, but it’s expected at 43.0 ft. the Red River will actually crest the I-35 road/bridge. WOW!! that's one of the best views I have seen of the water...sad to see it...Tx has been thru it this year! !